If you haven’t already downloaded your FREE copy of The Escape (The Chronicles of PJ Book 1) from Amazon, Kobo, Barnes and Noble, or Apple, go get it now. Every villain has an origin story …this is the Director’s. Gabriel Parker had it all: a loving wife, a beautiful daughter, a nice house, and a good job. How does a man go from all of this to someone who would train a five-year-old girl to be a killer for his Pervasive Justice program? The Director is a prequel to The Chronicles of PJ series that gives insight into the creation of a madman. 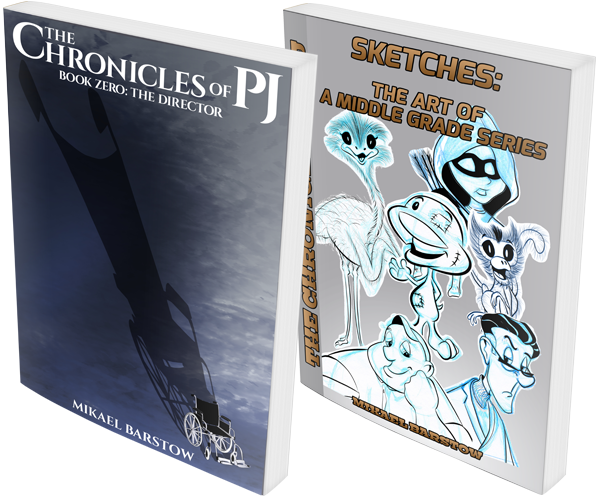 You’ll also get a FREE copy of Sketches: The Art of a Middle Grade Series, which is a behind-the-scenes look at the creation of The Chronicles of PJ series.